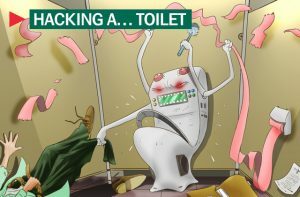 For years my husband has been begging someone to invent a toilet that cleans itself, lowers the lid, flushes when it needs, and ensures that you are never left yelling for someone for toilet paper……most of that technology is currently available and he could not be more excited. Bluetooth provides a user the ability to remotely control all aspects of the toilet from any smartphone. This is exciting news until we discover that poor secure coding practices left a very basic password on the system, leaving it easily vulnerable by attack from even your own child! How much fun would it be to continuously flush the toilet on mom while she is in the restroom! Programmers have to learn the basics of secure coding to ensure that this type of vulnerability is not built into critical systems that could impact safety or life. A quick vulnerability assessment or penetration test of the system during the System Development Life-cycle could have easily discovered this vulnerability prior to release.